It was the second semester of my freshman year. I was lazily ensconced in bed with my ex jamming to Ray LaMontagne when he asked me where I saw myself in 10 years. Kara Rodriguez* doesn’t feel smart enough to study for big exams without Adderall. Erika Hussein’s* tight-knit family is strict about grades. She’s afraid to disappoint them and calls Adderall a “necessary evil.” Alexa Smalls* mixes Adderall with caffeine pills she buys on Amazon for an extra boost while studying. Candy-colored pills, often dubbed “addy,” fill the pockets of UB students and offer them the most elusive 21st-century promise – the ability to do it all. Students who take Adderall say it allows them to focus on tests and still have energy to hit the gym and party over the weekend. The effect starts about 20 minutes after a pill is popped and the peak occurs about an hour and a half in. Omar David has never had a black professor. Most UB students haven’t. 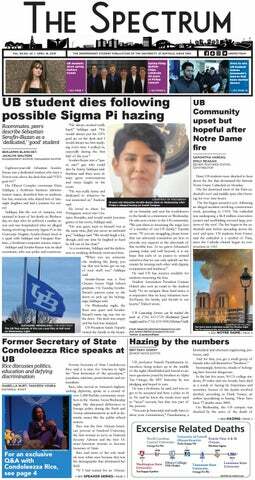 Robert Spencer’s impending visit is causing major tension across UB’s campus. Spencer, a controversial self-proclaimed radical Islam expert, will speak about the dangers of radical Islam in Knox 109 on May 1. Young Americans for Freedom (YAF) is hosting Spencer’s visit. Chairwoman Lynn Sementilli defended this decision saying public universities are the place for free speech and discussion, even for the most difficult topics. When people hear my high heels clink from a distance and spot a butterscotch blonde donned in a loose-fit romper, they know I’ve entered the room. I’m slightly embarrassed to say I regularly agonize over my outfits in the morning. I often change my outfit up to five times until I find the right one. I struggle to shut my drawer filled with clothes with the tags still on them on a daily basis. I’ve FaceTimed friends in a panic for second opinions on my outfits before I go out. University police closed off the road between Augsburger and Flint, after three vehicles were struck in a car accident. The person driving the car that started the accident was having a “medical emergency,” according to UPD Deputy Chief of Police Josh Sticht. Passersby broke the driver’s window open to get him out of the car before UPD arrived. In recent years, Student Association executive board elections had forgone conclusions, where parties ran unopposed or one party was practically poised to win. The Student Association executive board controls roughly $4 million of student money collected through the mandatory student activity fee of $104.75 per semester. The UB community woke up to large words reading “Black Lives Matter” in red, black and green paint on the bull outside of the Student Union on Wednesday morning.